We’re used to seeing Apple at the top of customer satisfaction surveys– it even promotes its multiple JD Power wins as the highest ranked smartphone and tablet on its website. However, the latest numbers from the American Customer Satisfaction Index has Samsung taking the lead from Apple, at least when it comes to smartphones. Samsung’s flagship model for 2012, the S III, receives an ACSI benchmark of 84 (on a 0 to 100 scale), beating Apple’s iPhone 5 at 82, the company’s most recent smartphone offering. Another Samsung model, Note II, shares the top of list at 84. Galaxy S4 is not included because the ACSI study was fielded just prior to its launch. While U.S. customers give Samsung’s smartphones the top scores, Korean consumers prefer Apple. According to the National Customer Satisfaction Index (NCSI) in South Korea, which uses the same technology as the ACSI, the iPhone 5 has higher customer satisfaction than Galaxy S III… Unlike Apple, which has a smartphone-only lineup, Samsung offers both feature and smartphones. At 76, Samsung continues to lag Apple for overall customer satisfaction. Nevertheless, the company’s 7% gain in 2013 is a clear reflection of the strength of Galaxy S III. 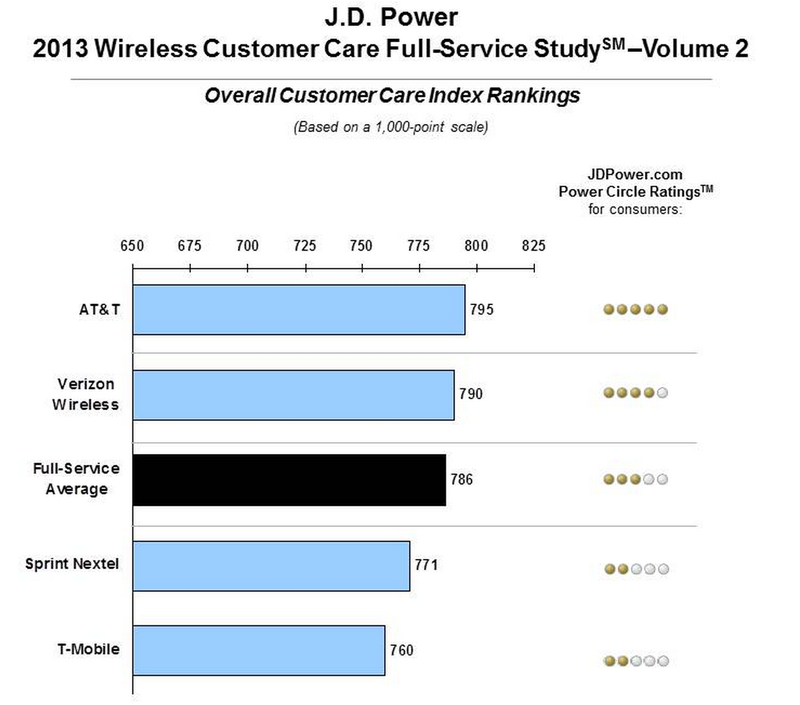 For the first-time, AT&T ranks highest in wireless customer care satisfaction among full-service carriers, with an overall score of 795. AT&T performs particularly well in the walk-in and online contact channels and ranks above the full-service average in four of the five service channels.